Politically, the phrase "top 1 percent" has become important — and again was cited recently by Hillary Clinton regarding the imbalance of wealth in our country. A different 1 percent is equally important. That's the amount of breast cancers occurring in men — with about 2,600 expected to be diagnosed with the disease this year, according to the Pennsylvania-based nonprofit, breastcancer.org. That figure puts the lifetime risk at 1 in 1,000 — small, indeed, but not insignificant. And life-threatening, perhaps, if you happen to be in that 1 percent. Because, unlike their female counterparts, men tend not to be screened regularly, the disease is likely to be more advanced when first detected. Risk factors, according to the breastcancer.org website, can include aging itself (the average diagnosis for men is 68), high estrogen levels resulting from taking hormone meds, being overweight or being a heavy alcohol user. Or having a strong family history of the disease or a genetic mutation (such as BRCA1 or BRCA2). Treatments may include surgery, radiation, chemo or hormonal therapy. 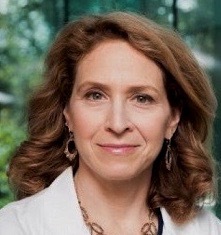 Experts cited by breastcancer.org include a radiation oncologist, Marisa Weiss of Lankenau Hospital; a surgeon, M. Lisa Attebery of Paoli Hospital; and a Ph.D., Jennifer Harned Adams of the University of Texas. Another expert, Gerry Bourguignon of Mill Valley, California, one of the regulars in my weekly drop-in breast support group, Marin Man to Man, has also been trying to spread the word about male breast cancer for years. He, himself, is a survivor. 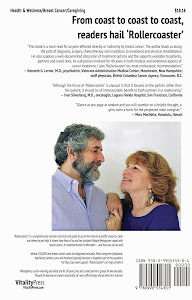 Want more information about the disease? 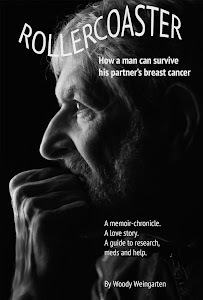 Consider reading "Rollercoaster: How a man can survive his partner's breast cancer," the VitalityPress book I, Woody Weingarten, aimed at male caregivers.